WHAT: A regularly occurring event, the Alive After 5 concerts features a live band, food, drinks, massage, access to the galleries and gift shop, portrait drawings, and Leslie giving 10 minute intuitive tarot readings and mini-Reiki sessions on the 3rd floor of the museum. Purchasing a ticket gets you access to the music and food (and it goes to a good cause, the museum), but without a ticket, you can see the galleries and reach Leslie on the 3rd floor. WHERE: The Knoxville Museum of Art near World's Fair Park with ample free parking. WHEN: Most Friday evenings from around 6-8pm, doors open after 5pm. WEBSITE: Check out http://knoxart.org/events/aliveafter5.html for concert schedule. WHAT: Leslie does intuitive tarot readings, mini-Reiki sessions, chakra tests, and often sells metaphysical products at this large Knoxville metaphysical event of readers, healers, and vendors. Leslie often presents one of the keynote speeches at this event. 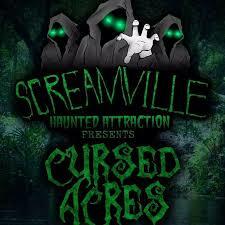 WHAT: Leslie will be doing intuitive tarot readings at this scary Halloween haunted corn maze attraction. Regular screaming promised (in maze not in Leslie's tarot readings). Lots of spooky events, food (funnel cakes!) and drinks. WHAT: This is a regular small outdoor music event. Leslie will be doing intuitive tarot readings (weather permitting). Vendors offer food, art, jewelry, and yoga. WHAT: This is a small spiritual community in Knoxville, TN that studies Religious Science and Unity teachings, as well as other personal development topics. 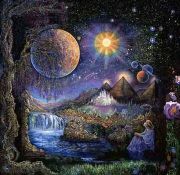 We believe that all is an expression of the Divine, so all spiritual paths are respected and welcomed. Leslie is one of the regular presenters of the Sunday Celebration Services inspirational talk. WHAT: Monthly or seasonal meetings to discuss different metaphysical topics. WHEN: To Be Announced; Join the group on meetup.com to get updates. WHERE: Usually Panera Bread in the Beardon area of Knoxville. COST: FREE to join group on meetup.com. ​$5 suggested donation for each meeting that you attend. 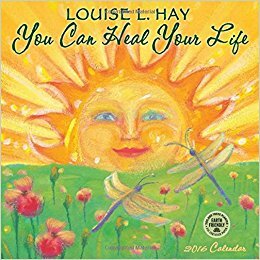 WHAT: Meet monthly to work through Louise Hay's book "You Can Heal Your Life". We will also use the related workbook and other book titled "Mirror Work". This powerful work teaches you the basics of affirmations and self-esteem. It is a life-changing system that will coach you to more happiness, health, and abundance. ​WHEN: New cycle to be announced. WHERE: Contact Leslie for address and details. ​The WiserheART Method of Tarot Interpretation has been developed over more than 10 years, rooted in scholarship and meditative insight. The WiserheART Method of Tarot Interpretation is a multi-level exploration into the Sub-conscious, Conscious, and Super-conscious aspects of your life using Universal symbolic wisdom encoded in Tarot. The WiserheART Method of Tarot Interpretation is a holistic approach to understand that looks at the Spiritual, Mental, Emotional, Physical, Energetic, and Relational aspects of a current situation. 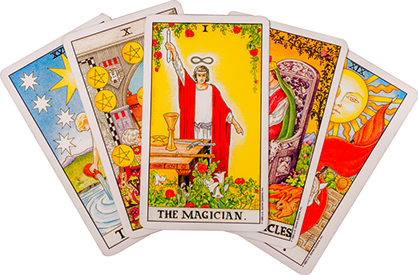 The tarot spreads developed in this method are big picture views that look at the interconnectedness of the wisdom presented in a reading. A 1-2 hour brief introduction to decoding the Rider Waite Tarot deck. Taught by Leslie Deatrick, a Holy Fire Karuna ® & Usui Reiki Master, this is an in-depth 2-DAY WORKSHOP devoted to exploring the chakra energy system as a complement to your Reiki practice. ¯ Wisdom of the 7 main chakras, including an chakra oracle (receive your own copy of this cool deck!!!!!). ¯ How to measure chakra health in Reiki treatment sessions. ¯ How to heal the chakras with Reiki. ¯ PLUS, you will learn about and receive an attunement to special Reiki symbols for each chakra. Participants must have completed Reiki 1 & 2 from a certified Reiki Master Teacher. Leslie is the only one offering a class like this in Knoxville; When this is offered, spaces are limited, so sign-up ASAP! Learn the basics of the chakra system. 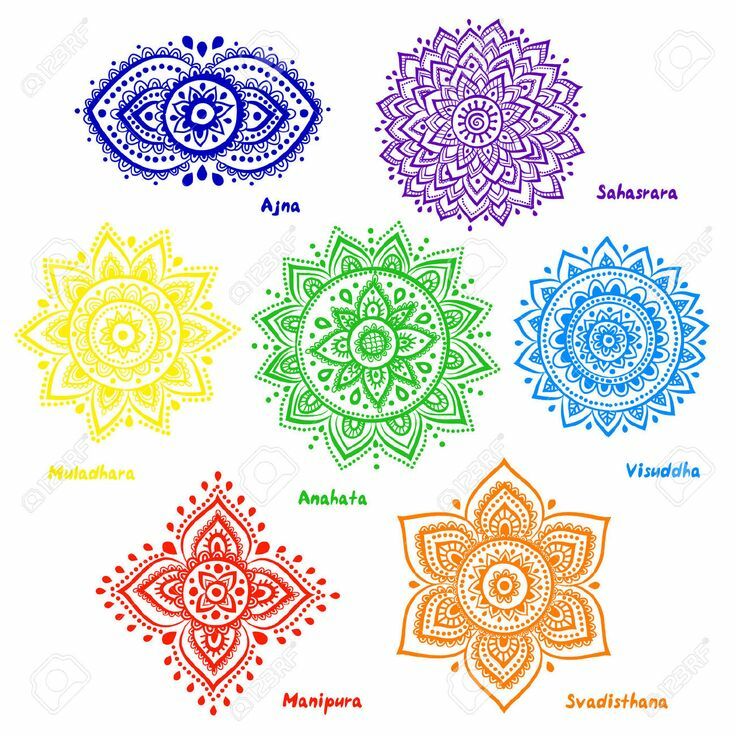 Learn the physical and symbolic issues related to each chakra. Learn how to boost your chakra wellness. WHAT: This will be an introduction course on a specific form of dowsing, using a pendulum as a metaphysical tool. You will also get a pendulum like one pictured below. 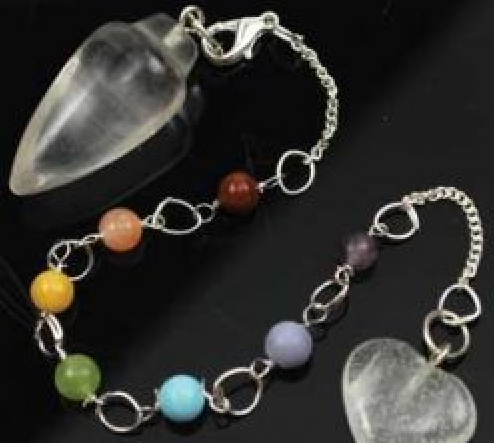 A pendulum is a wonderful tool that can help you clarify things in your life and develop your intuition. COST: $30 (includes the pendulum). Leslie teaches a very in-depth crystal grid class that empowers you to use crystals and stones to bring in more health, abundance, and protection into your life.